With this months Elle magazine (£4.00) comes an exclusive 20% Off ASOS Voucher (as well as a Tresemee Wave Creating Sea Foam freebie). These discount vouchers come as a blessing and a curse to me as although the extra discount is gold dust, it inevitably leads to spending hours trawling through the ASOS website (no easy task as they stock SO many things) which risks my sanity and my bank balance. Regardless of that, I love the beauty brands that ASOS sell and as I am going away in a few weeks I thought I'd stock up on some travel-size skincare to take with me. 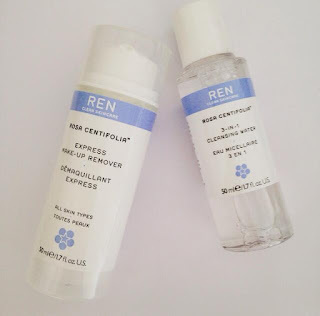 I have a few other REN products (the Flash Rinse 1 Minute Facial and Moroccan Rose Otto Body Cream) but I typically tend to scroll past the brand online when I am looking for simple make-up removal and toners as it is quite pricey in comparison to high street brands that pretty much do the same thing. 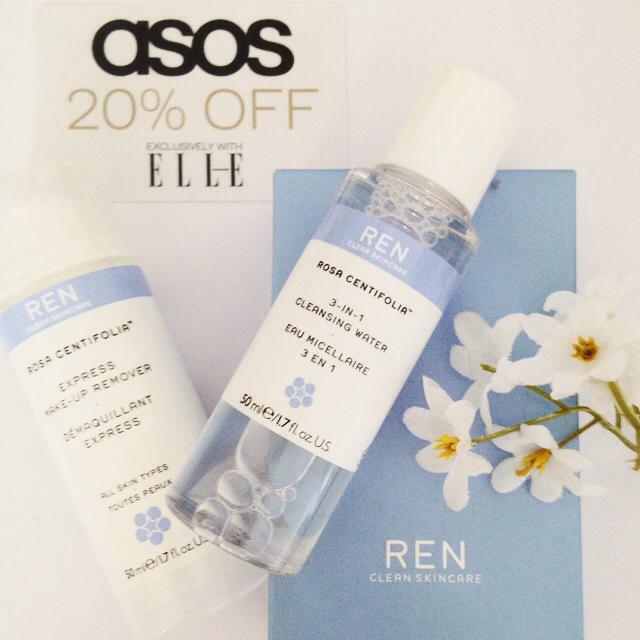 However, I saw that the REN Limited Edition duo was only £7 on the ASOS website, and with the voucher it came to just over a fiver. It comes with the 3 in 1 Cleansing Water and Express Make-up Remover, which are both from the Rosa Centifolia range. The reviews on both products are amazing, and the general consensus is that they are not drying on your skin which is a qualm of some of the make-up removers I have used in the past. Before I ordered this, there were so many items in my basket that it took a lot of self-restraint not to order them all. If you are a fan of Elle magazine, it is worth picking it up this month if you, like myself, are partial to an ASOS order...! Unfortunately you can't use the discount on sale items and it can only be used once, so choose wisely.